My day on the Ovens with Matt exceeded my expectations, it turned out to be a great day for me in my development as a fly fisher. I have been fishing over a period of years, but in that time have not really done a lot of fishing, so I still classify myself as a beginner. I was looking at my day with Matt to be educational - any fish caught would be a bonus. What was really good, was his ability to sort out my casting. I am now much more confident about being able to get the fly nearer to where I want it, along with being able to read the water better, and have an enhanced appreciation of what is going on in the river. 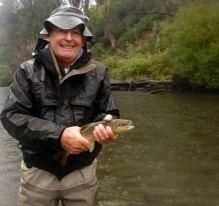 And catching the fish wasn’t bad either! I firmly believe that not everybody is suited to guiding, but you Matt most definitley is. He has a marked ability to pass on knowledge and engender confidence with a personality and disposition that makes it good to be out on the water with him. And he was so very generous with his time and advice. I certainly hope I have the opportunity to again wet a line in his company. Many thanks Matt. I had a most rewarding day. I can cast well enough to catch fish, but a short time on the water with Matt Howell taught me why 10% of fishermen catch 90% of the fish. Avoiding drag in fast moving water is always a challenge for a fly fisher and in a short time Matt gave me some simple casting techniques to extend my non-drag periods and allow me to tempt the fish with my fly for longer. After 17 years of fly fishing I now have a whole new appreciation and respect for the art of casting. Matthew Thanks for a great day. It was a day on the old bucket list that was beyond my expectations. After years flicking flies in my dam , catching my first wild trout ( a small brown) in a setting you only see on TV was brilliant. What I encountered over the next 6hrs was the best fishing any one could dream of. I estimate (as I lost count) 2 browns, 13 rainbows and about another 15 or so I buggered up. Lets not forget about 3 or 4 you caught while showing me what I was doing wrong. Thats not a bad days fishing!!! Hopefully over the next few years the tips and advice you gave me will allow me to get out into the bush and experience that day again, and as you said " not all days on the river are as good as this, don't give up". Thanks to my wife (Sharon) for a great Xmas present. I’ve only been fly fishing for a few months, but I’ve already been badly ‘bitten by the bug’. Many nights my beautiful, understanding partner - who indulges me in my new passion far more than I deserve – will come home from work to find me on the computer, reading the latest equipment review or looking up a fly pattern. It was on one such night that I was on The Flyfisher’s website and through luck and good fortunate I clicked on the “Casting Instruction” link and saw that there was a casting instructor in North East Victoria. We were going up to Bright for a long weekend and so I kept on reading – imagine the smile on my face when I read that Matt Howell not only lived in Myrtleford but was also an FFF Master Casting Instructor. 3 weeks later I was learning the subtleties of overhead casting from a master –Matt taught me the basics of casting, his lessons are fun and he went out of his way to help me – not only did my 1 hour lesson morph into 1.5 hours, Matt kindly sent me a video of my casting and emailed me information on what fishing gear to buy. We’ve recently been back to Bright for Melbourne Cup weekend and of course top of my list of things to do was a day’s guiding with Matt. The day kicked off at 7.30am and for the next 13 hours (how’s that for value for money !!) I had the most fantastic time. Matt took me into a place so remote it took 1.5 hours to get there and apart from some people camping close to the main road, we didn’t see another person all day. I was certainly put through my paces – the river’s current was strong, the rocks super slippery and consequently the wading challenged my fitness. But I loved every second of the day – the scenery was stunning, the sound of the river relaxing and hypnotic and to top it all I caught my first trout on a fly thanks to Matt’s expert guidance. 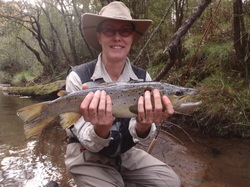 Highlight of the day was a magnificent 3.25lb brown – when we got that fish into the net, the adrenaline was pumping and I’ve still got a smile on my face 3 days later ! Matt is a brilliant guide – not only is he an expert at reading the river and knowing where the trout will be, he is so diligent in coaching you every step of the way to ensure you’re casting well, your fly is drifting drag free and you’re maximizing your chances of catching fish. Matt works so hard to give his clients the best day’s fishing, and he delivered in spades for me. If you’re thinking of fishing NE Vic, do yourself a massive favor and book a day’s guiding with Matt –trust me, you want be disappointed. I’ve lined up another day in autumn and can’t wait to get back up there. Went fishing last Thursday on the Motueka River and scored a beautiful 2.5/3 pound brown. I wouldn’t have taken it had I not had the expert tuition you gave us the other week, especially with regard to striking, fly drift, lies, etc. I have related our days fishing with you, to a number of people since I came home, and can honestly say it rates as one of the most memorable and satisfying fishing experiences of my life. Much of that enjoyment came from your input – your humor, quiet professionalism, (and piss poor Kiwi jokes) were all part of it. The experience of the Aussie bush revitalized me and took me back to years gone by. I loved it. You live in a very special part of the world and your continent. If you are ever over this way, I will be very disappointed if you don’t look me up. Take care and have a great season. Thanks again.